Ringwood is a residential suburb 23 km east of Melbourne, situated on the Maroondah Highway and the Lilydale/Belgrave railway line. The precursor of the Maroondah Highway was the track to the Gippsland and Upper Goulburn gold fields, via Lilydale, and before that the track to Gippsland's pastoral runs. A Log Cabin Inn was opened in 1850 for travellers at the future site of Ringwood. Timber getters and paling splitters were the first European occupants of the district. The Parish of Ringwood was surveyed and named by the early 1860s. The origin of the name is uncertain, the likely derivation being from Ringwood in the New Forest, Hampshire, England. In 1864 the Parish was brought within the Berwick Roads District, but transferred to the Upper Yarra Roads District a few years later. In 1872 when the Roads District was made a shire, Ringwood was part of Lillydale shire. In addition to timber and farming pursuits, antimony mining began at Ringwood. A large mine occupied the site of the future civic offices and was operated until 1892. A primary school was opened in 1874. The Log Cabin Inn became the Coach and Horses Hotel in the 1870s, and other stores and businesses opened nearby. There was also development at Ringwood East where the Club Hotel and the Mechanics' Institute were opened. The heavy soil was not particularly suitable for agriculture at first, but brick and tile making began in 1884. Two years before, the railway line was connected, from Camberwell to Lilydale. Churches established their own buildings, beginning with the Catholic church in 1872. 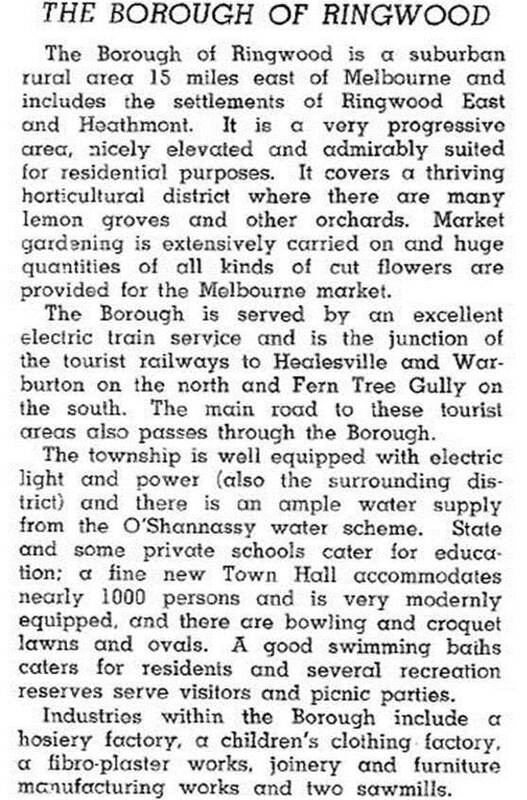 Reticulated water and electricity were connected to Ringwood in 1915, a decade when the population doubled to about 2000 persons. The Ringwood Railway Estate of 85 ‘grand villa home sites’ was released, located approximately where the Eastlink Tollway crosses Maroondah Highway. The progress association became active and separation from Lillydale shire was urged. The Ringwood borough was created on 22 October 1924, coinciding with the opening of primary schools at Ringwood North (1923) and Ringwood East (1924) and the electrification of the railway line (1923). The Ringwood East station was opened in 1925 and the Heathmont station, immediately south of Ringwood on the line to Upper Ferntree Gully, was opened in 1926. Civic pride was celebrated when the war memorial clock tower was dedicated in 1927, since moved to one side from the middle of the highway. Between 1924 and 1930 land subdivisions resulted in over 1100 sites being released. Whilst not all were taken up at once, population growth was steady. Numerous suburban amenities were opened – improved electric lighting, new Council offices (1927), a baby health centre (1929), a fire station (1930) and a concert hall (1936). A comprehensive sewerage scheme was planned during the 1920s, but its commencement awaited the postwar years and there was a long catch-up period as postwar housing quickly spread. Between 1946 and 1950, 450 houses were built and occupied in Ringwood. Over 80% of resident workers found local employment in factories and light industries. Orchards were sold and subdivision activity extended to Heathmont and North Ringwood during the 1960s. In 1954 a high school was opened and in 1960 a coeducational Ringwood technical school was opened in the Heathmont area. On 19 March 1960, Ringwood was declared a city, the year after the Council removed a landmark yellowbox gum tree for the duplication of Whitehorse Road. The Council was conscious that its local economy could suffer if it did not have a modern shopping centre, and it set aside 3.24 hectares, for a civic centre, shopping area and car park in 1959. The action resulted in protracted court proceedings, as it was considered to be beyond the Council's powers, particularly as it involved the compulsory acquisition of land. The Council's decision prevailed and the Eastland shopping centre was begun in 1966. The civic centre was completed in 1970. Ringwood was designated as a metropolitan strategic district centre. By 1995 Eastland had a gross lettable area of 37,000 square metres. A department store and a discount-department store gave it regional status. The nearby Ringwood Square Shopping Centre (1982, 15,000 square metres), is sub-regional. Between them is the Ringwood Market, a fully enclosed centre of 5600 square metres. The Highway shopping strip functions surprisingly well despite the competition. The upgraded Ringwood railway station includes a large bus interchange; its recent buildings contrast with the heritage listed station building of 1889. The redevelopment of the Ringwood Town Square and the Eastland shopping redevelopment was scheduled for completion in 2015-16. There are two well appointed reserves in Ringwood. Jubilee Park has two ovals and an aquatic centre and the Ringwood Lake reserve (1926) is a popular outdoor venue. Ringwood's commercial centrality in the metropolitan eastern corridor resulted in traffic bypass routes: parallel to the Maroondah Highway is a Ringwood Bypass Road linking to the Eastlink Tollway (2008) tunneled along the Mullum Mullum Creek valley; and there is the southern continuation of Eastlink through the Dandenong Creek Valley, taking motorists to Frankston. Ringwood’s suburban boundaries extend north-east from its commercial centre, along the north side of the Maroondah Highway and enclosing the Mullum Creek to the Yarra Valley Grammar School on Plymouth Road. As well as the Grammar School (1966) there are Norwood secondary college, Mullum primary school and Kalinda primary school. The original Ringwood primary school has closed. In Bedford Road, east of the railway station, the Catholic primary school (1932) has stayed put, alongside a brick church built in 1929. On 15 December 1994, Ringwood city was united with Croydon city and parts of Doncaster and Templestowe city and Lillydale shire to form Maroondah city.